The concept of negative resistance to explain sustained oscillation in certain types of tuned oscillator has been around for many years. In fact, it can be found in publications even prior to 1930 and I thought it might be an interesting subject to revive. In doing so, a few circuits are presented which take us back into the electron tube era. As a first idea, let's look at the circuit of Figure la showing a resistance R connected across a battery with an output voltage E. Current I flows around the circuit so that power is dissipated in the resistance equal to E x I. Conventional current flow defines that current flows from positive to negative through the resistance. However, the same current also flows through the battery but in the reverse direction, negative to positive. Now the resistance R is a consumer of power and R = E/l. On the other hand the battery, as a generator of power, is exhibiting a characteristic defined by -E/l = -R, that is, a value equal to that of the resistance load but reversed in sign. We look further at the AC circuit (Figure 1b) in which the current through resistance R is in phase with the applied AC voltage E. Current through the generator, whilst equal in value to that through the resistance load, is 180 degrees out of phase with the voltage E . Again the generator characteristic is defined by a resistance equal to load resistance but reversed in sign. The instantaneous currents through the resistance load and through the generator, as a function of instantaneous AC voltage, can be plotted as shown in Figure 2. From this figure we see that the slope of the curve is positive for the resistance load but negative for the generator. This leads us to the basis of what is defined as negative resistance. 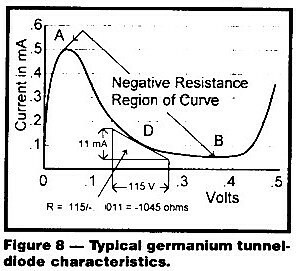 If the current versus voltage curve for a circuit has a negative slope, it looks like a resistance in reverse and is said to have negative resistance. As seen. from the previous paragraphs, it is the same sort of I vs E characteristic as a generator and a negative resistance circuit can be considered as a generator. Placed in parallel with a real, or positive resistance, it feeds energy to the positive resistance load. A tuned circuit is formed by the parallel connection of an inductor and a capacitor. If energised, the circuit oscillates at its natural resonant frequency but the intensity of oscillation decays as a function of time because of energy losses in the circuit. The loss can be represented by a resistance component either in series or parallel with the tuned circuit as shown in Figure 3. To maintain continuous oscillation, sufficient energy must be continuously fed into the tuned circuit to balance the energy lost. A typical electronic oscillator is formed by connecting the tuned circuit to the input of an amplifier and feeding part of the amplifier output signal back into the tuned circuit. This replaces the energy loss in the tuned circuit and hence maintains oscillation. Feedback can be achieved by inductive coupling from a coupling coil or via a feedback tap on the tuned inductor. In doing this, a four terminal or three terminal coil assembly is required. However, a two terminal coil assembly is achieved by connecting the tuned circuit in parallel with a circuit arrangement which has a negative resistance characteristic. Energy lost in the tuned circuit is supplied by the negative resistance circuit. 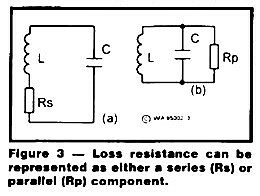 One might imagine the negative resistance as cancelling the positive loss resistance and, in effect, making the series loss resistance look like zero, or the shunt loss resistance look like infinity. An early development of the electron tube was the addition of a screen grid between the plate and the grid of the triode amplifier. The screen grid was connected to a high positive voltage and bypassed for signal voltage to ground. The presence of this extra element at high potential increased the amplification factor quite dramatically as well as providing a shield between grid and plate to reduce unwanted coupling between the output and input of the amplifier. 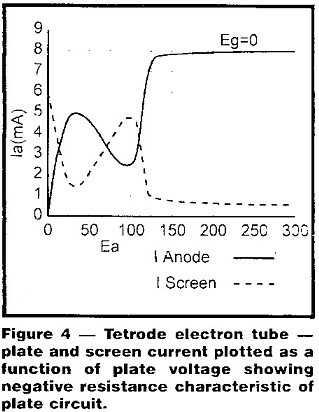 A problem with this tetrode tube is that, for signal conditions when the plate voltage is lower than the screen voltage, a phenomenon called secondary emission occurs. High velocity electrons attracted by the screen pass through the screen to the plate but, in doing so, dislodge even more secondary electrons, which are attracted to the screen. 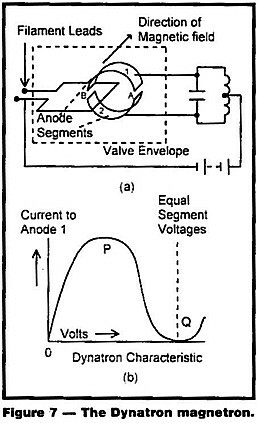 The plate and screen currents as a function of plate voltage are shown in Figure 4. It can be seen that. below a plate voltage of 130, the curves are somewhat erratic and unsatisfactory for linear amplification. To overcome this limitation, the suppressor grid was added between the plate and screen grid to form the pentode tube. The addition eliminated the secondary emission and linearised the curve down to a lower plate voltage point. Returning to Figure 4, we see that, between plate voltages of 40 and 100, the secondary emission actually causes the plate current to decrease with an increase in plate voltage. Now this is a negative slope and, whilst it is a nuisance from the point of view of amplification, it is a negative resistance which can be used to sustain oscillations in a tuned circuit. At this point we introduce an oscillator circuit called the Dynatron in which the negative resistance of the screen grid tube (or tetrode) is utilised. 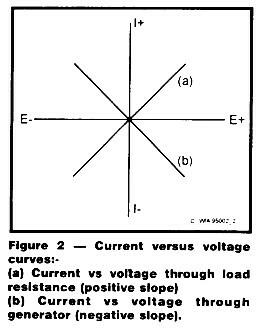 The circuit as shown in Figure 5 is operated with its plate voltage set lower than its screen voltage so that the operating point is close to the centre of the negative slope region of the Ia vs Ea curve. For the curve of Figure 4 this would be about 70 volts. The tuned circuit is placed in parallel with the plate and oscillation is sustained at the resonant frequency of the tuned circuit. 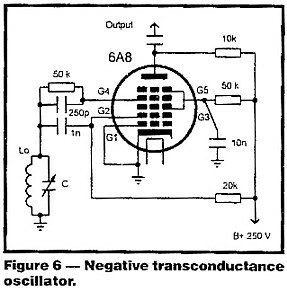 Another related circuit is the Negative Transconductance oscillator shown in figure 6. This makes use of the 6A8 pentagrid converter tube which, if set up correctly, exhibits a reverse transconductance characteristic between the control grid (G4) and the plate of the oscillator section (G2). With G4 and G2 coupled together, their effect across the tuned circuit is much the same as connecting the negative resistance circuit and, of course, we still have the two terminal coil assembly. The oscillator is quite stable and works well up to frequencies of 18 MHz. I have a modulated oscillator with this type of circuit which I built for receiver alignment some 50 years ago in my youth. It tunes from 125 kHz to 18 MHz in 6 bands, selected with a single bank switch. At the time I prepared this article, I still had the Oscillator and and it still worked. I am almost certain I used a circuit published in the journal Radio & Hobbies (later called Electronics Australia) but I have lost track of the article. The magnetron is well known as an oscillator at microwave frequencies using cavity resonators and phasing of feedback achieved by making use of the electron transit time delay. However, the magnetron was originally developed as a low frequency oscillator making use of a negative resistance characteristic exhibited by the device. A two segment split anode magnetron is illustrated by Figure 7. The two anode segments are connected to a tuned circuit and the electron stream is influenced by an external magnetic field which causes the electrons to travel radially within the evacuated tube. Figure 7b represents the static characteristic of the magnetron in which one anode segment (eg No 2) is held at a constant potential with reference to the filament and the magnetic field is set sufficient to cause circular rotation of electrons. If the potential of the other segment is varied and the anode current measured, the curve of Figure 7b is produced. When the voltage on segment 1 is very small, it receives very few electrons, but large current flows in the other segment. As the voltage increases, electrons are drawn in increasing numbers (point P). However, when the voltages on the two segments approach equality, the action of the magnetic field (set to a critical intensity) becomes fully operative and the electrons follow circular paths missing both anode segments. The latter condition corresponds to point Q and the portion of curve PQ represents the negative resistance. By connecting a symmetrical tuned circuit between the two segments, as shown in Figure 7a, use is made of the negative resistance to supply energy to the circuit. This type of magnetron is called a negative resistance or Dynatron magnetron as distinct from the higher frequency transit time magnetron. The value of negative resistance is determined by the slope of the curve and, for stable operation at the operating point, the bias supply must have a lower source resistance than the value of negative resistance. On the other hand, too low a source resistance can cause the diode to oscillate at a frequency determined by its inherent self inductance and capacitance. Hence the value of bias supply source resistance can be critical. Its value is represented by load line curve C in Figure 9. A circuit for a 100 MHz oscillator is shown in Figure 10. For the circuit to oscillate at the required frequency, the shunt resistance presented by the tuned circuit L-C1 at resonance must be not less than the value of negative resistance. 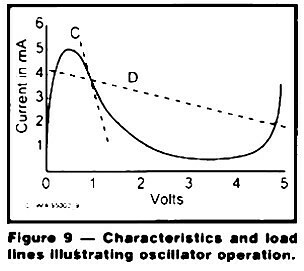 The resistance presented by the tuned circuit is represented by load line D in Figure 9. If the load resistance presented by the tuned circuit is less than the negative resistance, the circuit can also be made to operate as an amplifier. One might compare this to a regenerative amplifier where positive feedback is set to a level below the point of oscillation and the amplifier achieves increased gain resulting from the feedback. To operate as an amplifier, the input signal can be fed in series with the paralleled diode and LC combination and the output taken from the parallel circuit. Of course the input source resistance and output load resistance have to be carefully arranged to satisfy the criteria discussed above. 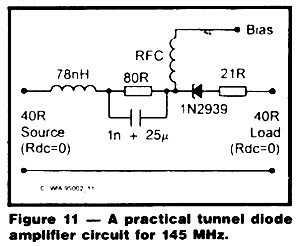 A practical circuit designed to amplify at 145 MHz, taken from an early issue of Amateur Radio, is shown in Figure 11. The designer of this circuit claimed gains of 30 to 40 dB at 145 MHz. The tunnel diode as an amplifier is somewhat limited to RF work as its linearity is hardly satisfactory for linear service such as in audio amplification. 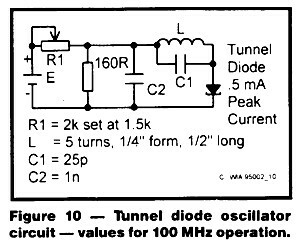 One difficulty with the tunnel diode is the low voltage required for its operation. The negative resistance region is around 50 to 300 millivolts, requiring a bias voltage in the order of, say, 100 millivolts. It is a very high frequency device with operation possible at 1000 MHz, or even higher.
. "There are two ways of regarding the action of any oscillator which uses a two terminal circuit to fix the operating frequency. One is to consider the passive network as a feedback element between the output and input terminals of a power amplifier The other is to picture the amplifier as a negative resistance coupled to the passive network." What has been highlighted is the second way using the negative resistance concept. Some of the discussion in the original article is of historic interest. The Dynatron oscillator, as we have known it, has been passed by with the phasing out of the electron tube. At the time the tunnel diode was first introduced, it was thought to have a bright future at microwave frequencies because of its ability to perform at these frequencies with low noise. As it has turned out, it also appears to have been surpassed by better microwave performing devices. There are various transistor circuits which have been made to look like a negative resistance source and work using a two terminal tuned network. There are also various integrated circuit packages which incorporate a tuned oscillator by connecting a two terminal tuned network. These days we tend to consider such packages as a black box and don't worry too much about how the circuit works inside the box. If we did, we might see a circuit which we could regard as a negative resistance source. An interesting application is the Lambda Negative Resistance circuit using an N Channel and a P Channel JFET interconnected. This circuit has been used to make a Dip Meter. (ref 10). 1. Fundamental properties of Thermionic Valves - Radio Receiving Unit 2 - Melbourne Technical College. 2. Radiotron Designers Handbook 1955 - Section 24.2 - Negative Transconductance Oscillators. 3. Admiralty Handbook of Wireless Telegraphy - Section K63-65 The Magnetron. 4 RSGB Amateur Radio Microwave Techniques - Magnetron Oscillator. 5. Weber, F Sven - Tunnel Diode Amplifier - Amateur Radio, July 1965. 6 . Watters & Claeys - The Tunnel Diode Story - Amateur Radio, October 1960. 7. Review - Bright Future for the Tunnel Diode - Radio, TV & Hobbies, May 1960. 8. Rowe, Jamieson - Understanding Tunnel Diodes - Radio, TV & Hobbies, February 1961. 9. Rowe, Jamieson - Practical Aspects of the Tunnel Diode - Radio, TV & Hobbies, September 1961. 10. Butler, Lloyd (VK5BR) -A Dip Meter Using the Lambda Negative Resistance Circuit - Amateur Radio, January 1997.